BEA AHBECK/NEWS-SENTINEL Trucks drive down Hw 99 through Lodi during an Operation Black and Blue protest Friday, Oct. 6, 2017. LODI — Truckers across the state are protesting an upcoming federal rule that will mandate all interstate truck drivers install an electronic device that logs their hours. The protest came through Lodi on Friday, as dozens of long-haul drivers traveled along Highway 99 in the early afternoon. The goal of the protests is to get the rule, set to go into effect in December, scrapped as well as several other rules they say are onerous for owners and operators. According to the Federal Motor Carrier Safety Administration, the electronic logging device, or ELD, is intended to help create a safer work environment for drivers, and make it easier and faster to accurately track, manage and share records of duty status data. Truck drivers, some whom have already installed the devices, say the devices are costly, cut down on the amount of hours they can drive and may make conditions unsafe for those on the road. Khan, who has owned the business with his brother since 2012, said he drives the Interstate 5 corridor between California, Oregon and Washington as well as other western states hauling dry freight, produce and frozen vegetables. By law, truckers can work 14 hours a day, with a maximum of 11 hours of driving time. Once the electronic logging device is activated, it stays on for 14 hours straight, according to the protesting truckers. They must stop even if they are in a dangerous area, they said. That’s a non-starter for Adam Atwal, a trucker from Atwater. Long-haul truckers protested at the State Capitol in Sacramento on Thursday, and in front of city halls in Fresno and Yuba City on Friday. But the protest that came through Lodi was different. 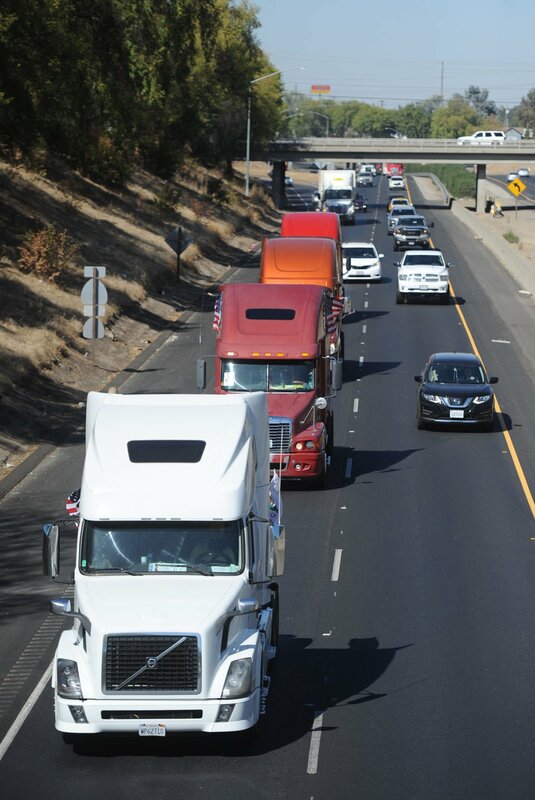 Instead of a stationary protest, a convoy of big-rig trucks — hauling nothing — drove between Yuba City and Fresno. The trucks were equipped with signs protesting the ELD and other regulations. A few were decorated with American flags. The convoy was part of Operation Black and Blue, a nationwide effort to draw attention to the new laws. The truckers who traveled along Highway 99 through Lodi appeared to be driving at the speed limit, but witnesses in Sacramento said some of the trucks were driving slowly and a couple stopped in what seemed to be an attempt to stop traffic. The California Highway Patrol asked all drivers to obey traffic laws while protesting. “Although the CHP supports the right to ... protest, doing so in a manner that blocks traffic, (or) slows the response of emergency vehicles and people traveling throughout the state is against the law and extremely dangerous,” the agency said in a statement. Not every trucker who disagrees with the new regulation participated in Friday’s protests. Lodi and Acampo are home to a handful of trucking companies, but those contacted Friday said they did not believe any of their drivers had participated in the protests. One of the companies said its trucks were already equipped with the new devices. None of the companies wished to comment on the new regulation. Khan and his company didn’t join in because he’d rather have the trucks on the road moving freight for customers, he said. Others were concerned that the protests could be a safety issue. News-Sentinel staff writer Kyla Cathey, KCRA digital editor Sarah Helse and Fresno Bee staff writer Lewis Griswold contributed to this report.